I've searched multiple sites and forums... seems that this wire coding does not match what normally comes in a 1998 xle camry..
any ideas on which wire is which? Does the radio have a remote amp? I'm not sure about that. Where would it be and what would it look like? I really don't know much about cars, but connecting some wires together... How difficult could this be? I've already got the stereo ready to be mounted.. All I need to do is connect these wires! The wiring diagram you refer to is for a newer model car. The 98 would have a different setup. Can not find your wire colors in any manuals. Have you checked for a remote amp located behind glove box or behind left side passenger kick panel or under the passenger seat? 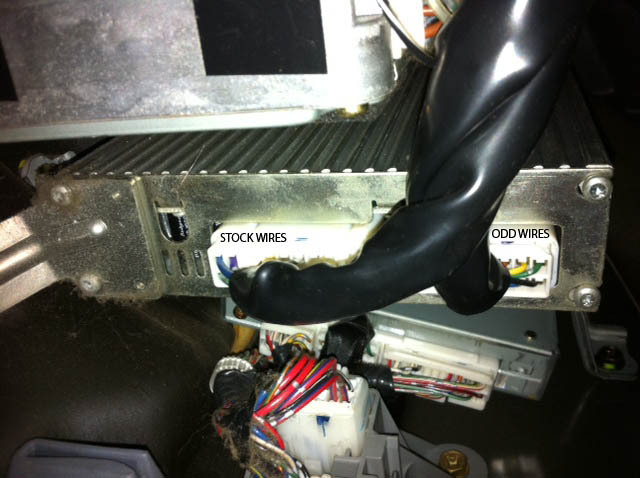 Are some of the wires in the harness of coming from the chassis shielded. Wrapped together, separate from the others? Are you sure the wires of the same colors each go to a separate speaker? 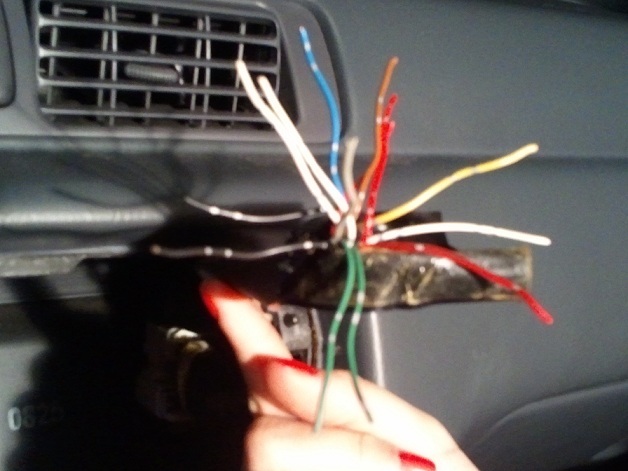 Look at the wiring for the speakers in the trunk. Thank you so much for your input. I will look for an amp of some sort. I had previously looked at rear speaker wires to see if they matched any on the harness. They are thicker and are green and gray, on both speakers.. I think you are correct in assuming there may be an amp.. I'll update again once I've found out more information. Found what I believe to be the remote amp. Correct me if I'm wrong, but it must have an input and an output for the wires?? The stock colors that I was looking for are connected to a harness and plugged into this amp. Then the odd colors I could not recognize are also plugged into the amp. Could I bypass this amp altogether? This would probably end up with poor sound quality I'm guessing. Hoping I can plug the other harness into my stereo, but I think it's too big. and this guide is in the thread... I'm done for tonight and will resume tomorrow. Last edited by jahl519; 06-12-2011 at 11:12 PM. As the Toyotanation posts state look around in the radio dash hole for a set of 2 plugs. They may be taped over and hidden. These plugs will fit a Toyota radio having a built in amp. The Scosche 87-up Toyota Harness is a set of 2 plugs that plug into a Toyota radio with built in amp. These plugs are the same as those that could be in the dash. The Scosche plugs have loose wires that can be spliced into the cars wiring harness if this is the only option. If you can find the plugs in the dash you may be able to plug in a Toyota radio with built in amp and have everything work OK. If you find the 2 plugs you and are using a non-Toyota radio that does not uses these style of plugs you can get an adapter harness that goes between the radio and the 2 plugs. I talked to a guy working at this shop..
That's also the product I'm going to order for another 15... I guess I could cut the wires myself and splice em cause the Kenwood aftermarket I bought that I'll be using came with a harness and open wires.. Seeing as how I'm outta my element with this stuff, gonna make it as easy as possible. Guy told me, unplug the regular hookup wires from the amp I found behind the glove box and plug the harness adapter he's gonna send me into that+the kenwood stereo I got. Does this sound correct? Well, I'm gonna have to wait till I get this piece but I'll update once I've tried it.. Again, thanks for the input and quick replies! Did you find the the 2 other plugs in the stereo dash area? The link you provided appears to be a harness that converts the plug on the Pioneer stereo to the Toyota 2-plug wiring harness. 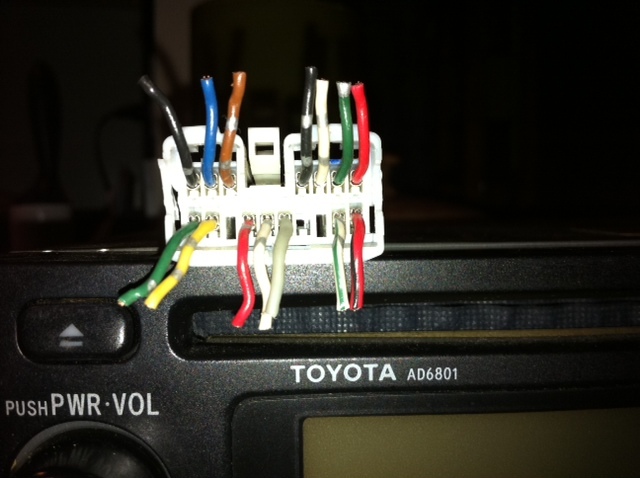 The wiring plug you disconnected from the Toyota stereo is a 1-plug harness. To use the connection harness in the link you would need the Toyota 2-plug harness. If you found the other 2-plugs you can use the connection harness to between the new radio and harness plugs then unplug the amp. The link below has the wiring diagram for the 2-plug system.